From lower border of atlantal arch (and more superiorly to the occipital bone) and upper borders of lamina of C2. It contributes the stabilization of the atlanto-axial joint movement that overall allows 10-15° of flexion/extension and 30° of axial rotation. - Can originate in a congenital conditions, but in adults, it is primarily seen in the setting of acute trauma or degenerative changes due to the inflammatory pannus of rheumatoid arthritis (RA). 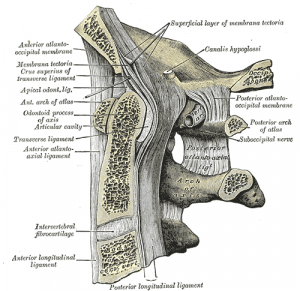 - The ossification of the posterior atlantoaxial membrane that led to the development of cervical myelopathy is rare. There is no record of specific treatment of the Atlantoaxial ligament complex. Hovewer, in case of AAI or rupture, the treatment should include the cervical stabilization management . 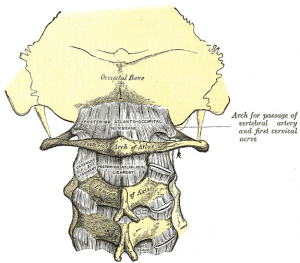 Check this page about Cervical Instability for further information. ↑ Gray, Henry. 1918. Anatomy of the Human Body. Bartleby.com. Retrieved 2012-09-27. ↑ Hall, Graham C et al. “Atlanto-Occipital Dislocation.” World Journal of Orthopedics 6.2 (2015): 236–243. PMC. Web. 25 Apr. 2017.